The original green and purple Combiner enters to the Transformers Trading Card Game Wave 2 “Rise of the Combiners” expansion! Thanks to Kotaku website we can share for you the Superion Cards! We have images of the combined cards forming Devastator, Towering Warrior, as well as the individual cards of Bonecrusher, Hook, Longhaul, Mixmaster, Scrapper and Scavenger. The original 6 Constructicons are coming in hot. Additionally, we have an image of the Contructicon Enigma Card which is necessary to form the combiner once you get all the individual cards. 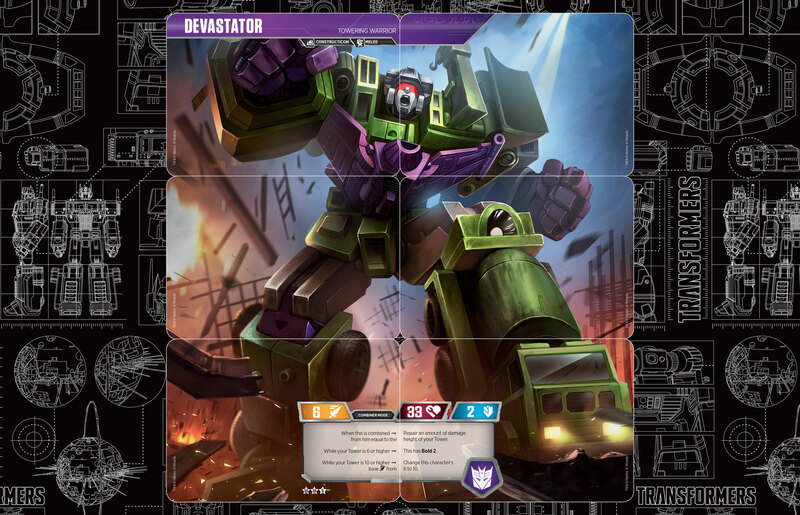 With six component robots, Devastator may be slightly harder to bring into play than combiners with only five parts, but you will be rewarded with very powerful and devastating warrior with a special ability that contributes to the building of a tower. The higher the tower, the more benefits the robots’ combined form gains. Do you want more? Devastator comes as a standalone Rise of the Combiners deck! All the six announced combiners for the Rise Of The Combiners expansion have been finally revealed. You can check out the cards of Predaking, Volcanicus, Menasor, Optimus Maximus and Superion on these links. Get ready to grab your new cards when they are out in stores in March, 1st. Huh? After this reveal, many knew this was a set acquired outside that of Booster boxes. Even the title of this thread points out this is a pre-constructed deck releasing roughly a month later after Wave 2 boosters release plain as day and again stated within the thread. I fail to understand the point of your statement. That the Devy set was announced as its own pre-con was announced when Devy was revealed is *part* what comes with being revealed. Heck, many even speculated that if Devy was to be released it was most likely a stand alone akin to Metroplex deck. Here again, I fail to see your point.. Considering the TFW news posting for the Devastator reveal noted that Devastator was one of the "six Combiners", when it wasn't, and only noted the March 1st date of the Booster Packs… while the official facebook page had to repeatedly point out to people on there that Devastator was coming out later (more people were posting comments about it being released with the other combers and not on its own), I didn't see too many people (other than yourself and this topic starter) noting that it was something they were going to have to wait to get later, and instead were talking about Devastator as if it was coming out March 1st in the booster packs with the other combiners. My point was that some people weren't seeing that there really was an oversight by the general public (as seen on the facebook page and fansites), and Devastator shouldn't have been revealed until after the Booster Pack reveals (we were all given specific dates by WOTC to reveal our ROTC cards, and the dates for my reveal of Dreadwing was after Devastator – so because of that, and based on the feedback posts online, it looked like Devastator was the sixth combiner to many people, to be released with the other five on March 1st in the booster packs). You probably didn't see that oversight by others because you had an interest in the TCG and payed attention to the specific details that many others missed (including me for the first couple of days, until the people at WOTC gave me the info to reveal with Dreadwing). What's with the 6 space grid next to the characters. You'd think Mixmaster & Scrapper would be the bottom two spots since that is where they end up. What's even more funny is that the art for Devy's leg on Scrapper is Mixmaster in leg form and the art for Devy's leg on Scavenger is Scrapper in leg form. Maybe they accidentally mixed the slot parts when displaying the cards? I guess we'll see come end of next month. There is already a thread about this topic. Devastator is a constructed deck coming out March 29! With box art image 'n' all. Can one of the mods please merge? (to all posters, pls check this entire sub-forum before making a new thread to ensure a thread does not already exists). I still regret not getting CW Devastator. Wow the constructicons look so good I wish they were made part of the WFC or the combiner wars line, might get this deck box also as there stats are alright for me. Oof. If I'm a collector I'm worried about the crease getting messed up on those two folded cards on the left side. Unfortunately, this hasn't been highlighted much on the fansites, and few people seem to realize that Devastator was NOT one of the six combiners in the second series… it is a separate deck pack being sold separately like the Starter Pack for the first series, and is being released four weeks after the second series booster packs (main set) come out. That the Devy set was announced as its own pre-con was announced when Devy was revealed is *part* what comes with being revealed. Heck, many even speculated that if Devy was to be released it was most likely a stand alone akin to Metroplex deck. Here again, I fail to see your point. I really hope that isn't showing some of the cards pre-folded. I hate the whole folding idea in the first place and if they're folding them for the in package display, that's really going to annoy me. Sorry to say this, but if that pic is accurate, you're going to be annoyed. If this is of any consolation – it doesn't have to continue to be folded. The concern here was eventual wear 'n' tear after much use. If the rumors of the materials used on the creasing is true, being folded once or twice will do no harm/wear at all to the card. Apparently Devy deck was shown off at this year's Toyfair. It appears to retail for $25 USD. Wave 2 releases March 1st. Devastator set releases March 29th. The Devastator Deck, a standalone deck product is demolishing shelves March 29th in most territories! Devastator is a standalone deck product. One more to go in the main set! And the sixth "combiner" according to the official facebook page, was Dreadwing, not Devastator. Devastator's face doesn't look menacing though. No one knows 100% for sure yet as it hasn't been revealed. All we can speculate it is a another counter building feature which we keep track of that comes with the Devastator Combiner starter that grants Devy additional benefits as it grows. We also know that along with the Constructicon Enigma, there are 4 more battle cards unique to this set and here too we speculate it will have something to do with putting another counter on the Tower. Wow!! they fold!! Excellent!! I had no idea. Is it too late to catch up on this??? Maybe i'll dash down to my local card shop and see if the have any in. No I'm not going backwards that far. When I hit 21 I'll start going up again… or just stay there.